It seems like people are always asking me recommendation storage boxes and bins. Usually, there are just too many factors to take into account to have a “go to” solution: size, material, cost, aesthetics. My one exception are Samsill’s POPn’ Store Storage Boxes. I’m the Professional Development Director of NAPO Houston (National Association of Professional Organizers). Therefore, I’m tasked with choosing the content and booking speakers for our monthly meetings. Once a year, we typically have a vendor expo for which I need to find exhibitors and giveaways for our attendees. In 2016, Samsill provided us with a dozen of these boxes to use as door prizes. Their marketing folks saw I blog and, consequently, asked me to write a product review. Truth of the matter is: I will not recommend a product on this site unless I have personally used it. It’s been a year and I love these boxes so much, I bought another half dozen to complete my living room. The POPn’ Store storage boxes go from flat packed to popped up in less than five seconds. If you have even a moment of difficulty putting these together, that’s a secret you should probably keep to yourself! Also, POPn’ Store boxes are far superior to the boxes most commonly available from IKEA, which seem like they are almost all made of thick paper (super duper thin cardboard) or fairly brittle plastic. Lotus Seed textured paper covers the heavy-duty chipboard for maximum strength. 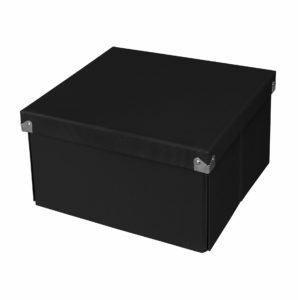 In sum, these storage boxes are ridiculously sturdy and are great for stacking. Currently, I am using the Essential Box to house our extensive DVD and BluRay collection. I used to have these items out on the shelf but really thought it was looking too busy. 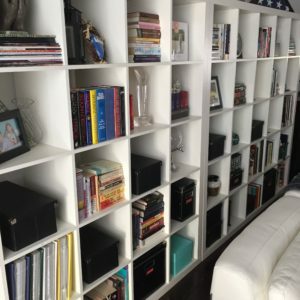 These boxes contain it all and totally simplify my bookshelves. Additionally, I use Document Boxes on my entertainment center to house all the weird things I keep there. For example, one holds cat brushes and nail clippers, another holds manicure tools and polishes. This isn’t a complete rave review as I have one complaint: there is no place for a label and the super durable paper covering isn’t the most conducive for a standard Brothers or Epson label. My solution: I print tiny labels and place them on the shelf holding the boxes. 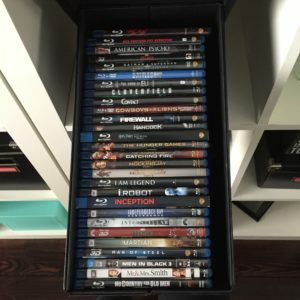 An Essentials Box holds more than two dozen movies.